20 seg. de cada tema. On May 7th 1774 the bishop Manuel Antonio de Palmero y Rallo died in Girona after a long illness. Born in Villalobos in 1706, he was a cultured and reformist member of the clergy who was well connected with the Court being one of the first bishops appointed by the Madrid government in 1756. This was done with Romes permission according to the Agreement of 1753. It was he who built la casa de Misericordia in Girona, which his nephew bishop Lorenzana added to the new Hospice then in the process of being built. The present day Casa de Cultura (cultural activities centre) is the result of the joining of these two buildings. Palmero was in favour of expelling the jesuits (1767), and made the most of their expulsion to install the diocesan seminary in the convent that they had to abandon. Although no details of his funeral service ceremony have been preserved, it must have been extremely solemn, following the tradition by which both the city and the diocese would contribute to the ceremony so as to make it really impressive. The musical contribution was the responsibility of the new chapel master, FRANCESC JUNCÀ, a priest who had obtained that post by eliminatory exam just five months before. At that time Girona was enjoying a time of demographic and economic growth after the defeat of 1711. This involved the creation of new aristocratic and religious buildings plus the restoration of old palaces coupled with the appearance of small factories. All are signs of a new urban vitality. It is within this expansive setting that Juncà composed the present Requiem. Francesc Juncà, born in Sabadell in 1742, began as a choir boy in Montserrat, and was later to become chapel master of Santa Maria del Mar in Barcelona. He then obtained the same post in Girona in 1774 at the age of 32. He stayed here for a short time only, as in 1780 he obtained the post of chapel master at Toledo cathedral, the ecclesiastical capital of the Spanish state. This position was the highest within the ecclesiastical music hierarchy. Juncà began the process of musical colonization beginning in Girona and spreading to cathedrals situated beyond the southern limits of the Ebro river. His successors Balius, Arquimbau and Pons continued this process. Juncà remained in Toledo until 1792, when he retired as chapel master. However, instead of returning to Barcelona or his birthplace Sabadell, he chose to reside in Girona. When he returned, he was only 50 years old, so he occupied himself with a variety of activities, not only music. This would be due to his erudition although these activities have not been researched. He also continued to have a very good relationship with the court in Madrid. Juncà showed this when in March 1814, Ferdinand VII, having been freed from imprisonment in Valençay on his way to Madrid, spent 5 days in Girona at Casa Carles, in the plaza del Vi of Girona. The king departed in the early morning accompanied by Juncà, as ordered by the cathedral chapter, to Arenys de Mar, the diocesan boundary. He travelled on horseback in spite of being 72 years old. His last important intervention was in 1826 on the occasion of the building of the new cathedral organ. He persuaded the Chapter to situate it in the centre of the only nave, thus placing it nearer to the musicians yet behind the clergy choir. It is still in the same place today. 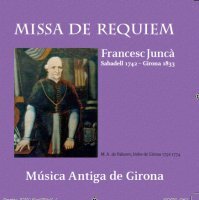 Many members of the Girona congregation who Juncà had in mind when he composed this Requiem, were middle class people dedicated to their trades and who expected cultural enjoyment as well as sociability from religious music. The musical style used by Juncà is called the galant style nowadays by certain specialists. It avoids baroque complexities and uses easy, pleasant melodies with effective orchestration. Whereas in the Girona of 1700 the chapel master Josep Gaz looked to the court of Madrid for inspiration, his successor Gònima, around 1750 looked to Naples, Juncà was to turn to Vienna and Paris. However, unlike the style of his Viennese contemporaries W.A. Mozart for example in this Requiem Juncà develops no complicated musical constructions such as themes, counter themes, variations and other musical contrivances. He prefers to limit himself to brief exhibitions of melodious subject matter, well selected, very varied and of remarkable expressiveness. Each one of the parts of this Requiem mass is preceded by a brief instrumental introduction based on the violins. Then follow the four voices performing in a variety of combinations, choir, solos, duos and trios. These voices stand out in greater or lesser grade depending on the meaning of the text that the composer wishes to draw attention to. Juncà conveys his interpretation of the liturgical text to his listeners by means of a varied combination of voices and instruments while following the units defined by the verses of the text. They are relatively short units, separated by silences that are very useful for preparing the listeners ears for the changes of rhythm and tone involved in each unit. Curiously, the bassoons and the percussion are not among the orchestra instruments. The various movements of the composition culminate in the central Sequentia, where the composer attains a remarkable level in the expression of the moods suggested by the admirable latin verses. The voices predominate over the instruments, certain of the solos are exceptional while this preponderance is inverted in the verses of the Tuba mirum where the horns appear in the sonorous foreground. Equally remarkable are the verses of the Lacrimosa dies illa. Once the bishop Palmeros funeral mass was over, a short procession would then take place within the cathedral itself up to his grave, situated in front of the high altar. While this short procession was going on, the mandatory response, Libera me Domine, would be sung. This response, which is most likely the one that is to be found among the anonymous scores of the chapter house archives, could be attributed to Manuel Gònima, the recently retired chapel master, because of its style. For this reason we have added it to this CD. The text of this response is contrived with verses that are repeated several times and the instrumental part is similar to Juncàs Requiem, except for the wind instruments which are absent. Following Gònimas style, the composition has no instrumental prelude and the initial movement, which is so sad as to be almost dismal, contrasts with the restrained sadness of the central part. According to the tradition, the cantos at solemn funerals were interpreted both by the music chapel and the choir of canons. The latter, however, sang in the gregorian style. This is what we find in the present Requiem where the Tractus, the second verse of the offertory  Hostias et preces and the Benedictus -- correspond to the gregorian style. For this reason were not set to music by Juncà. In this CD the gregorian chanting in the latter case has been replaced by the same verse from the Requiem by Jaume Balius (1781-¬85), Juncàs successor as chapel master in Girona. The Benedictus, however, corresponds to the text with the same name from a noteworthy motet by Domènec Arquimbau (1785-90), Balius successor. In this motet the horns are prominent. Arquimbau is buried in in Sevilla, where he moved to from Girona. In the attached text of the Requiem the beginning of these changes is indicated with a asterisk.